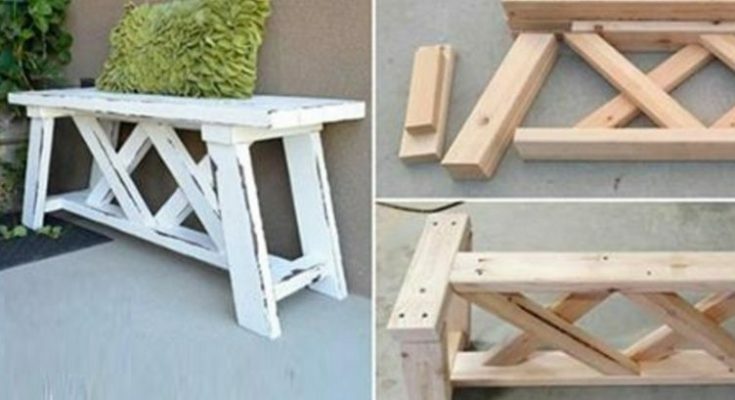 Got a couple of dollars and want to build your own DIY outdoor bench? What are you waiting for? Building a small woodworking project is a healthy exercise in do-it-yourselfing, and working with wood is a pleasure. Where would you stick this DIY bench? Probably in your garden or garage, but you could put it on your porch or inside your house as well. So what do you need for this bench? Well, some 2×4 lumber — about $13 dollars worth of it. In addition, you’ll use some sandpaper, some wood glue and stain / paint to finish it, as well as a paint brush to put it on. Plus you’ll need some basic tools like a saw and drill. This design was put together by TheIdeaRoom, who come up with all sorts of project ideas on a regular basis. The author of TheIdeaRoom got the idea from Instagram where someone posted a bench she liked, and she made her own. So we’ll send you over to her site now if you’re ready to take on your own DIY work bench project: How to Build an Outdoor Bench for $13.